Cairo (Agenzia Fides) - Also this year Egyptian President Abdel Fattah al Sisi will take part in the solemn Coptic liturgy of the Christmas vigil, scheduled in the new Cathedral dedicated to the Nativity of Jesus, built in what will be the new administrative capital of Egypt. It will be the fifth participation of the current Egyptian President at the most solemn celebration - presided by Patriarch Tawadros II - of the Christmas holidays in the Coptic Church. The upcoming liturgy is presented by the Egyptian media as a kind of official inauguration of the place of worship, given that last year the Christmas vigil was celebrated in the new cathedral when the construction work had not yet been completed and the church still presented itself as an open construction site. The participation of al Sisi at the liturgies of Coptic Christmas, usually broadcast live by national television, also aim to show the balance between the major Christian community in the Middle East and the current strong man of Egypt. Al Sisi is the first Egyptian President to have physically taken part in the liturgical solemnities of the Copts. The same new cathedral (see photo) also wants to represent a symbol of the political strategy. The current Egyptian Presidency has directly contributed 100,000 Egyptian pounds to the first financing of the massive urban planning work. According to the Egyptian leader, the new place of worship represents "a message for Egypt and for the whole world". 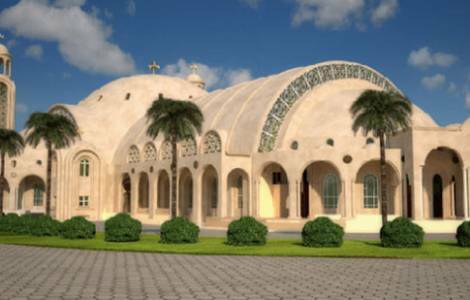 The Egyptian media present the new Coptic cathedral as "the largest church in the Middle East". The architectural profile of the cathedral, faithful to the Coptic tradition, wants to recall the profile of Noah's Ark, and thus re-propose the image of the Church as a "boat" of salvation that navigates among the troubles of history, towards the heavenly goal of Paradise. AMERICA/COLOMBIA - Mgr. Henao: to stop the killings of social leaders, we need to build "community leadership"